With a fevered pace second to only Tokyo, Osaka is the Japanese urban travel experience you’ve always imagined. On the surface, Osaka is much of what you’d expect of a post-war city in Japan, seemingly little more than a drab endless jungle of concrete. Flying into nearby Kansai airport puts that enormousness in perspective. As far as the eye can see a sea of washed-out Lego-block buildings spreads. Make no mistake: despite it’s colourless outward appearance from above, Osaka is a fantastic place to explore. Sure, it’s not Tokyo. And to suggest otherwise would be an insult to any proud Osakan. It’s this immense pride and a cagy lust for life that brings an energy to Osaka that’s summarily contagious. Missing may be the sophistication of Kyoto or the tamer outlook of Sapporo. But what Osaka does, it does well. Walking along Dotonbori is enough to confirm the city’s energy, though through the tastebuds though is perhaps the best way to experience this buzzing city. No Japanese city takes the kuidaore (“eat until you drop”) attitude more seriously than Osaka. Not sure where to begin? 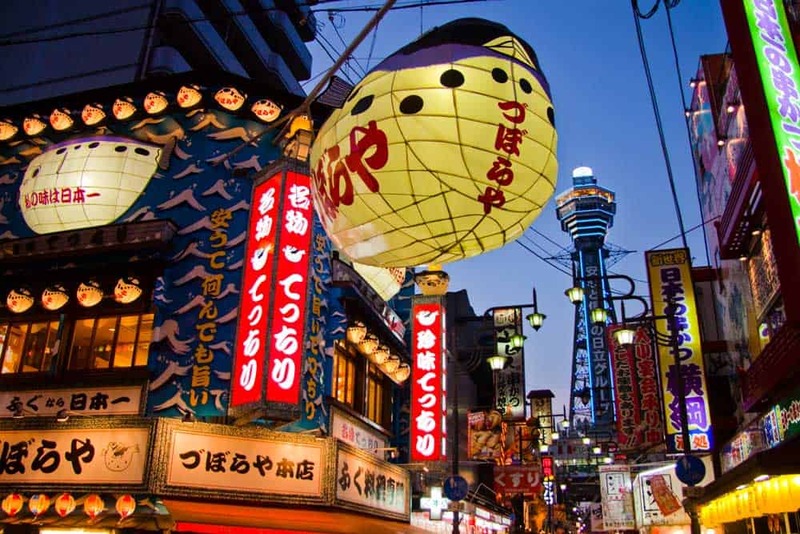 Let’s take a quick look at the top 10 things to do in Osaka, Japan. Nailing down what to do in Osaka isn’t always such a difficult task. This immense city of almost 9 million will always keep you busy! 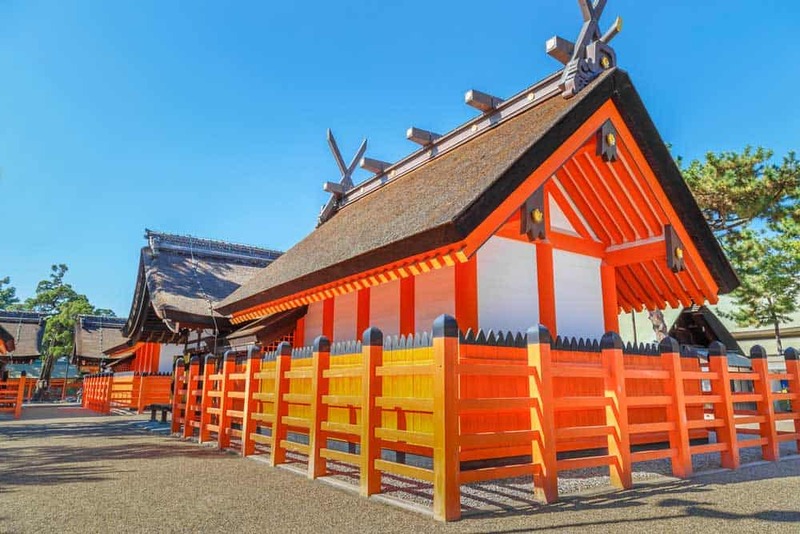 From the blazing colours of Dotonbori to the ageless graces of Osaka Castle, there’s something to snag your attention in every corner of Osaka. 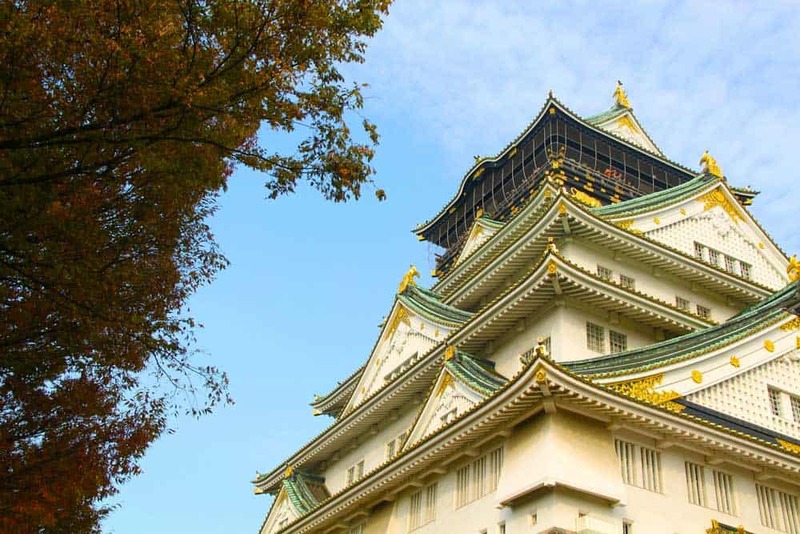 Even if you’ve only got one day in Osaka, you simply can’t miss Osaka Castle. Originally built in the 16th century by warlord Toyotomi Hideyoshi, this magnificent building stands as one of the last vestiges of ancient Japan in a city that never ceases to surge forward. Before you even enter, you’re greeted smilingly by Osaka Castle Park, one of the city’s most popular recreation spots. Walking around the park and its surrounding gardens paints a beautiful classic scene year-round. If you can hack it, visit in spring when the cherry, plum, and peach trees here become bathed in delicate pink hues. Nishinomaru Garden (¥200) is, in particular, one of the best places to spot cherry blossoms in Osaka. Inside, Osaka Castle houses an expansive museum that reiterates the traditions of Edo and Azuchi-Momoyama periods. Far more interesting for most travellers though is the 8th-floor 360-degree observation deck that supplies tremendous views in all directions. Getting to Osaka Castle: Several metro stations ring around Osaka Castle including Tanimachiyonchome, Morinomiya, Osakajokoen, and Osaka Business Park. From any one of these stations, it’s a pleasant 15-minute stroll, give or take, to the castle itself. Lining the picturesque Dotonbori-gawa Canal, Osaka’s premier entertainment district of Dotonbori gets the blood flowing like no other destination in the city. Osakans love letting loose here, whether that means tackling their Kansai cuisine favourites or indulging in a traditional bunraku performance in its birthplace. In many ways, the scene in Dotonbori encapsulates the entire modern urban Japan travelling experience. The glowing neon advertisements, sprouting from the banks of the canals, are nothing less than captivating and create a upbeat atmosphere for evening exploration. Aside from all the visual stimulation, Dotonbori is famous for its food. This is, by far, one of the city’s best places to eat, serving up must-eat Osaka foods like okonomiyaki and takoyaki. Don’t miss a chance to check out some of the best restaurants in Osaka including the delicious kushi-katsu of Kushikatsu Daruma and the succulent crab of Kani Douraku. When the buzz becomes a little too much to handle, search for your inner peace at the nearby Hozenji Temple. The alleyway adjacent to temple, Hozenji Yokocho is a famous Osaka attraction on its own featuring a string of bars & eateries along an atmospheric alleyway that hearkens back to the charms of old Osaka. Getting to Dotonbori: From Namba Station (Exit 14) is a short walk north up Mido-suji (270m) to the Tombori River Walk along the Dotonbori-gawa Canal. Any visit to Osaka is incomplete without a trip down memory lane among the oddball nostalgia of Shinsekai. Originally built to herald a “new world” before the onset of WWI, the in-vogue neighbourhood attracted visitors in droves who came to see its optimistic vision of the future at work. Not long after, Shinsekai’s heart began to beat around Tsutenkaku Tower, Osaka’s answer to the Eiffel Tower. From its founding in 1912 until WWII, when it burned down, the tower stood at the centre of Shinsekai, proudly beckoning Osakans to its streets. In the intrawar period though, Shinsekai fell out of vogue. The magic seemed all but lost until post-WIII when Osakans’ aching nostalgia yearned for a return to the good-ol’ days. The area embarked on a long road to recovery starting in 1956 with the rebuilding of Tsutenkaku Tower. Today, there are still plenty of things to do in Shinsekai. Sucking in the panoramas from the 91-metre-high observation deck of Tsutenkaku Tower gives an awesome bird’s-eye view, and is a must for visitors unshaken by heights. Like Dotonbori, Shinsekai’s near the front of the line for gourmands, offering some of the best street food in Osaka. Don’t leave this wacky neighbourhood with trying its most famous delight, kushi katsu, deeply satisfying battered and deep-fried kebabs featuring succulent meats & vegetables of varying types. Getting to Shinsekai: The closest metro is Ebisucho (Sakaisuji Line), a short 4-minute stroll to the centre. Imamiyaebisu (Nankai-Koya Line) and Dobutsuen (Midosuji Line) stations are also both within 10 minutes by foot. If the dazzling time-capsule of Shinsekai leaves you yearning for quieter times, crawl into the backstreets of Namba to Hozenji Yokocho, an atmospheric alleyway running north from the beautiful Hozenji Temple. By day, Hozenji Yokocho hardly seems worth visiting with little more than a typical Osaka laneway with a few quiet & handsome wooden-shuttered façades. By night, it’s a different story. The faint glow of neon signs hums as paper lanterns sway between the alleyway’s several dozen bars, cafés, and restaurants to hearken back to the aura of old Japan. Despite its small stature, Hozenji Yokocho hits heavy in the Osaka food scene. Don’t miss tantalizing your tastebuds on mouth-watering local favourites like takoyaki (octopus balls), okonomiyaki (savory Japanese pancakes) and kushikatsu (deep-fried battered skewers) in one of the eateries along this charming strip. Already stuffed from gorging on Osaka street food? Carve out some relaxation time to visit the alleyway’s namesake, Hozenji Temple. This small Buddhist temple is famous around Japan for its moss-covered statue of Fudo-myo. What’s special about the statue—called Mizukake-Fudo—is that it was one of the only things in the area to survive the WWII bombing raids of Osaka. Join local worshippers and splash the moss with water for good luck! Getting to Hozenji Yokocho: From Exit 14 of Namba Station walk straight up the small east-west street to the crooked alleyway that leads to the Hozenji Temple. Hozenji Yokocho is the narrow street heading north from temple. 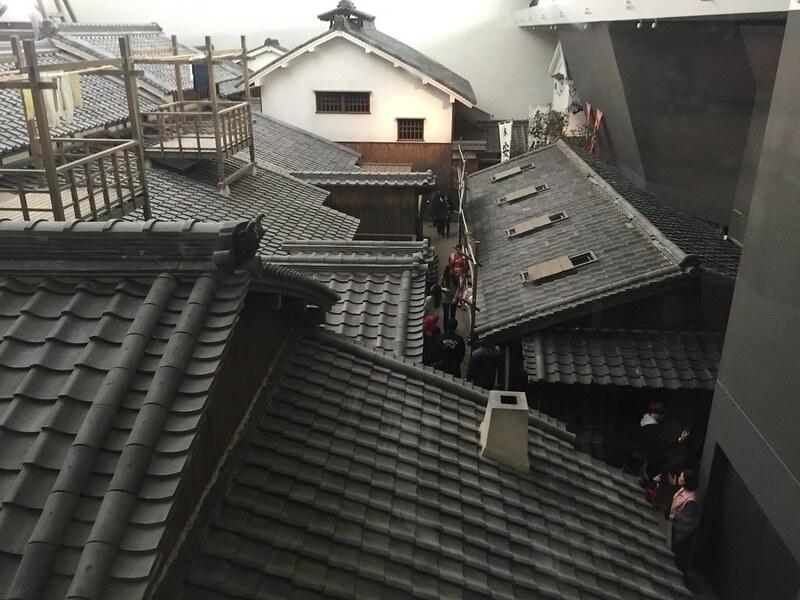 Besides the model town, the Osaka Museum of Housing & Living features a number of dioramas that enlighten on Japanese architecture and culture throughout the ages. Most interesting for visitors might be the pre-WWII models of Tsutenkaku Tower and Luna Park in Shinsekai and Shinsaibashi-suji Shopping Street. Make the museum one of your last attractions in Osaka to compare the replicas to the real thing! Getting to the Osaka Museum of Housing & Living: The museum is located adjacent to the Tenjinbashisuji 6-chome metro in Kita. Use Exit 3 for quick access. Osaka’s rife with shrines & temples, but none’s more important than Sumiyoshi-taisha Shrine. The origins of this impressive Shinto shrine are a little fuzzy with dates of founding ranging somewhere between the 3rd and 5th centuries. The current reconstruction of Sumiyoshi-taisha, completed in 1810, recreates the mood of the original’s wholly unique Japanese architectural style, sumiyoshi-zukuri. Unlike many other shrines & temples around Asia, sumiyoshi-zukuri is characterized by simple straight roof lines, rather than elaborate curves, and forked gables. Aside from exploring the main buildings of the shrine complex, the beautiful grounds are a wonderful place to while away an afternoon in relaxation. To witness one of the classic scenes of Sumiyoshi-taisha, find a vantage point to snap a shot of the high-arched Sorihashi Bridge (also called Taikohashi) amid the greenery and stone gates. Getting to Sumiyoshi-taisha Shrine: The quickest (and more interesting) way to get to the shine via public transportation in Osaka is via the Hankai Tramway Uemachi Line. This cable car undertakes the journey from Tennoji near Shinsekai (¥200) in just 15 minutes. Alternatively, the Nankai train runs between Namba and Sumiyoshi-taisha or Sumiyoshi-higash. Lucky enough to be in Osaka in cherry blossom season? No viewing spot in the city is quite like Kema Sakuranomiya Park. This famous riverside park centres around a 4.2-kilometre promenade lining the banks of the Okawa River. Along the stretch,over 4,800 cherry trees dazzle with their delicate pink blossoms when you time your visit just right. 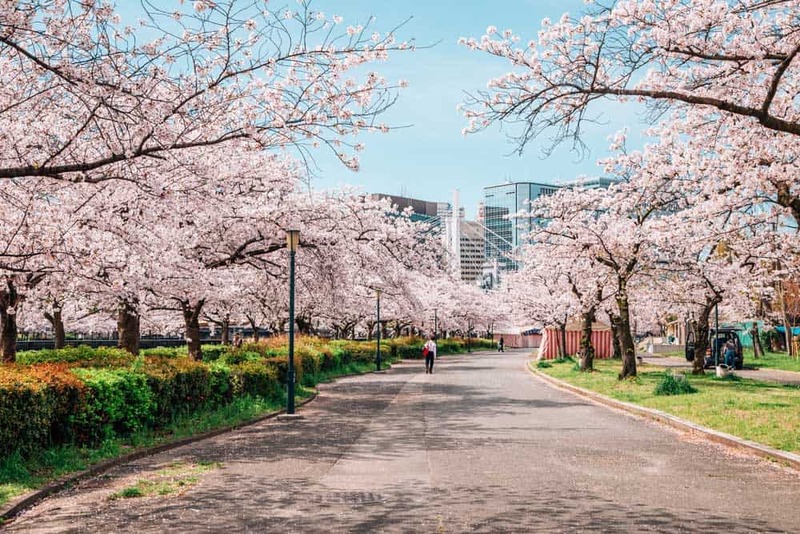 Whether you’re there for hanami or not, strolling along the riverbank and on the walking trails at Kema Sakuranomiya is among the most relaxing activities to help you unwind from the trappings of Japanese urban life. Jump onto an Okawa River cruise to catch the park’s wispy trees at their finest from afar. Getting to Kema Sakuranomiya Park: From Sakuranomiya on the Osaka Loop Line, head towards the Okawa and turn left at the riverside promenade. Walk south for less than 10 minutes to get into the heart of the park. Think puppets are just for kids? Don’t tell that to the serious performers at the National Bunraku Theater who’ve made it their lives’ missions to keep this 17th-century Japanese dramatic art pumping in modern Osaka. Bunraku performances revolve around three main elements: puppetry, storytelling, and music. The puppet masters—highly-skilled & teamed up in threes—bring tremendous realism to the large puppets’ movements. Alongside, a narrator (Tayu) melodically voices the characters, changing the tone to reflect each of their vibes. 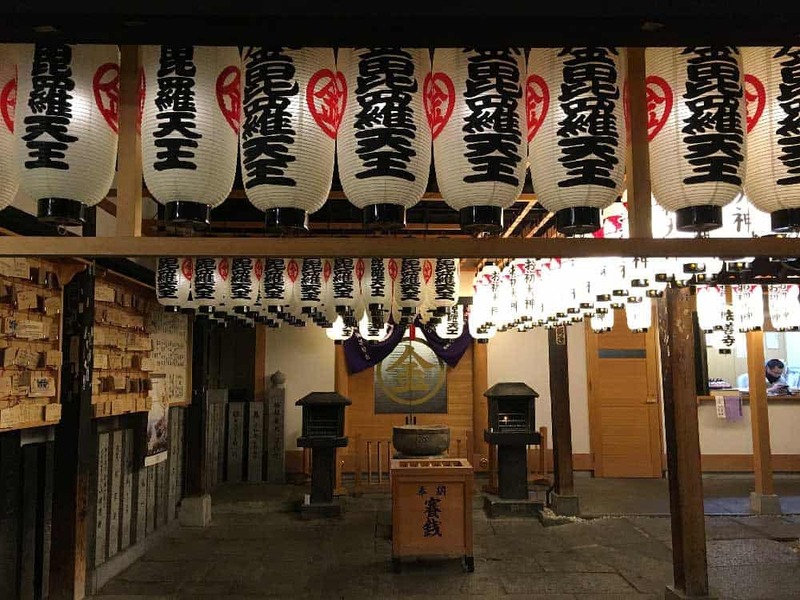 Even if you can’t speak Japanese, you’ll enjoy attending a bunraku performance at this intimate hall. English performances are available along with earphones to translate the dialogues of Japanese-language plays (¥700 + ¥1,000 deposit). Single-act tickets cost just ¥1,000. 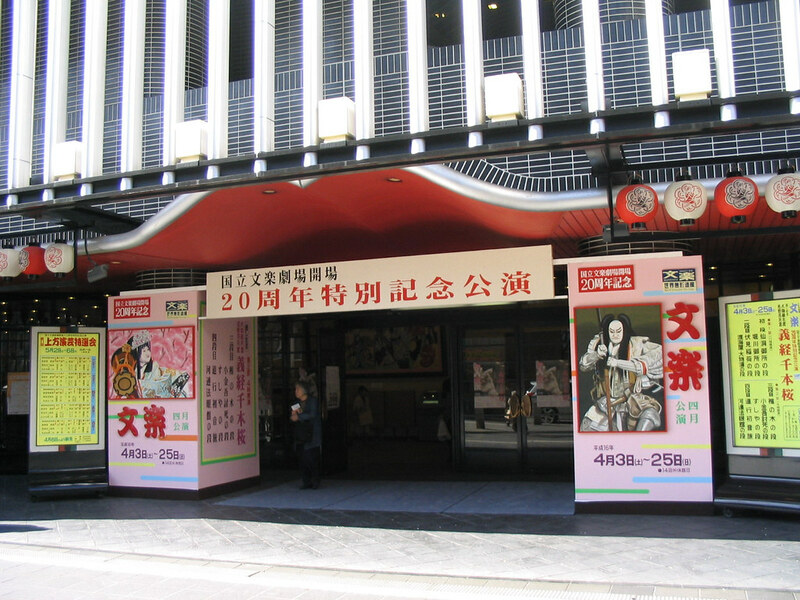 Getting to National Bunraku Theatre: To closest metro stop is Nippombashi. Walk straight out of Exit 6 along Sennichimae Dori. The theatre will be the third building to your left. 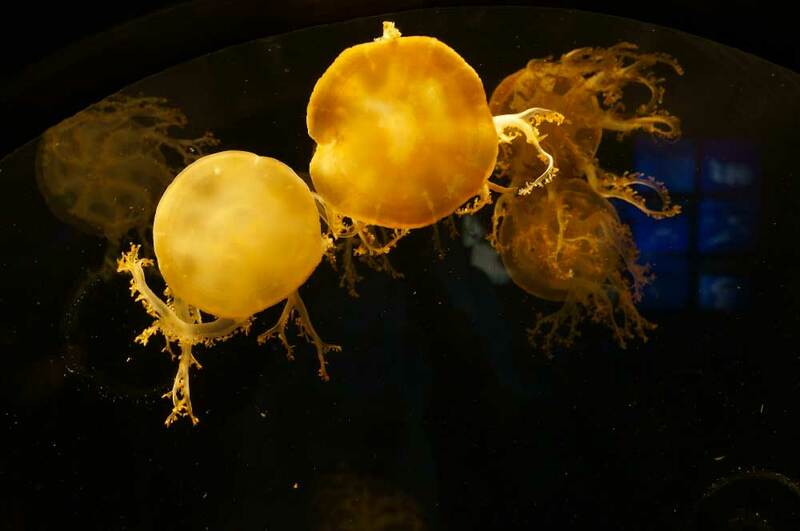 You don’t need to be a kid to love the dazzling array of marine life at Osaka Aquarium Kaiyukan. As one of the biggest aquariums around the globe, this top Osaka tourist attraction impresses from the moment you catch a glimpse of its magnificent building overlooking Osaka Bay. Entering into Osaka Aquarium Kaiyukan, with its unique spiral design, unfolds an ethereal world before your eyes. Starting at the top, you’ll descend past 15 tanks that host over 600 different species from around the Pacific Rim. All the while, keep your eye on the centre tank (not that you could miss it!) to catch sight of the aquarium’s claim to fame, it’s two giant whale sharks. Want to skip the line? Get your Osaka Aquarium Kaiyukan Tickets ahead of your trip! Pick up is available at Osaka Kansai Airport and Osaka City Air Terminal (JR Namba). Getting to Osaka Aquarium Kaiyukan: The closest metro stop to the aquarium is Osakako on the Chuo Line. From here it’s about a 10-12 minutes walk via Tempozan Market Place. Dotted with endless high-end fashion boutiques, Shinsaibashi is the ultimate stop for fashion-lovers to shop in Osaka. Wherever you wander in this neighbourhood, you’re bound to find something that catches your eye. 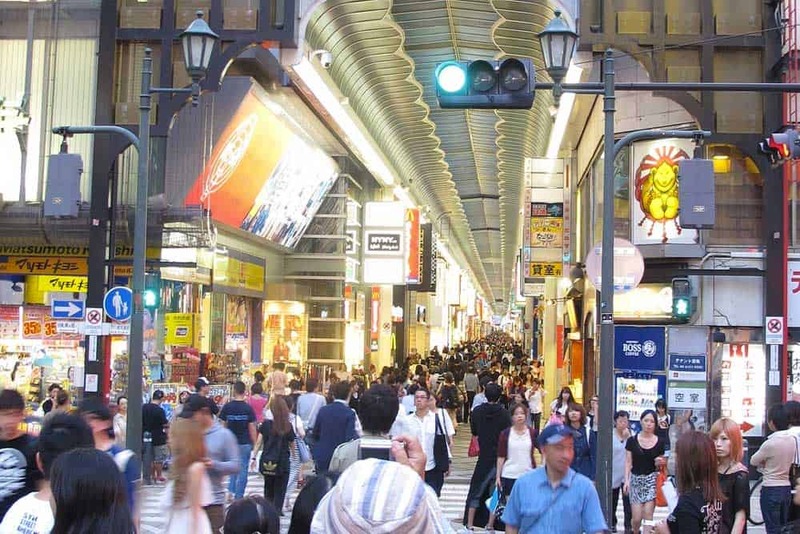 The most fascinating part of the area is undoubtedly Shinsaibashi-suji Shopping Street, a 580-meter-long shopping arcade running north-south from Dotonbori to Nagahori-dori Street. Despite the pull of Shinsaibashi-suji Shopping Street and Mido-suji (Osaka’s high street), there’s far more to Shinsaibashi than just shopping. The area’s dotted with some of the best restaurants in Osaka where you can chow down on specialties like takoyaki, okonomiyaki and kushikatsu. It’s also one of the best places in the city to let loose with raucous nightclubs popping up all around. For a taste of something a little different, head to the western part of Shinsaibashi and explore America-mura (American Village). As Osaka’s favourite youth counter-culture hangout, it’s a colourful place to walk around to catch the edgy fashion trends as they’re happening. Getting to Shinsaibashi: The area is most easily accessible by the subway station of the same name on Midosuji Line and the completely unpronounceable Nagahoritsurumiryokuchi Line. Even from Namba Station it’s just a short walk north along Mido-suji to the heart of the neighbourhood. Choosing where to stay in Osaka isn’t always an easy task. Osaka’s got a serious case of sprawl, and if you’re not sure how to narrow down your search, you’re gonna end up with a tad too much choice. Red Roof Inn & Suites Osaka Namba Nipponbashi: A delightful modern hotel occupying a prime location in Namba. Rooms feature contemporary colourful designs for homely feel. Mitsui Garden Hotel Osaka Premier: A brilliant excellent value 4-star hotel on the quiet Nakanoshima Island. Top rooms show off spectacular views and rich furnishings. The centre of Umeda is a quick jaunt away (the hotel also offers free shuttles to guests). InterContinental Hotel Osaka: One of the top luxury hotels in Osaka. Rooms are decked out with über-modern furniture and high-flyin’ skyline views through large picture windows. Five on-site dining options including delectable French dishes paired with 20th-floor panoramas at Pierre. Umeda Station is just 7 minutes away by foot. Want the quintessential Japanese urban experience? 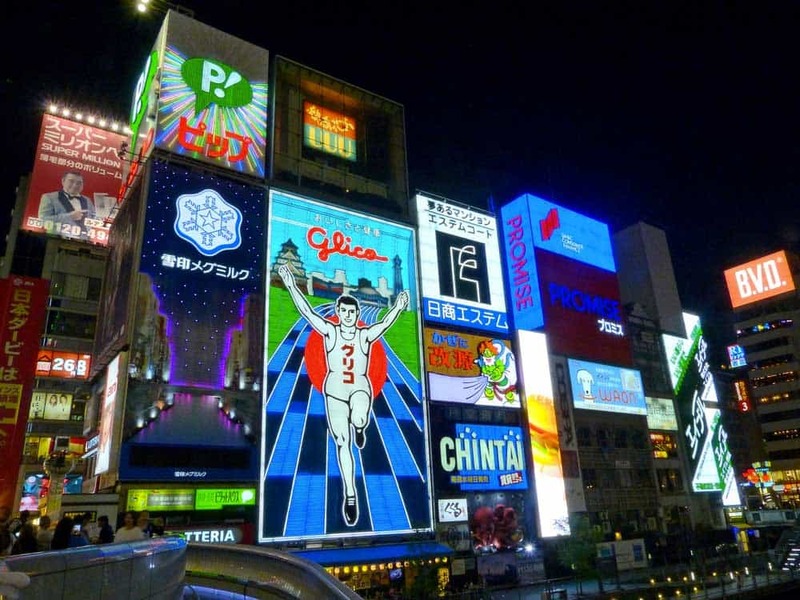 Scroll along Dotonbori at night to witness the endless blaze of neon surging into the sky. Ready to chow down on some Osaka food? Duck into the restaurants and eateries around Hozenji Yokocho to fill your belly with the city’s most appetizing delights. Feel the need for relaxation? Find your inner peace in a quiet corner in the grand expanses of Kema Sakuranomiya Park.